This article is part one of a four-part series exploring the Whole Child Framework, a conceptual framework for school design developed by TruexCullins. Subsequent articles will discuss each element (Wellness, Learning, and Engagement) in further detail. Over the years we have had many great discussions with our school clients about their goals for their students. While much of the conversation has centered on implementing 21st century learning concepts in schools that focus always seemed too narrow. What about other important factors in designing our schools such as sustainability and security, for example? In searching for a framework which unifies these seemingly disparate issues, we took a step back and asked the question: What are schools really about? Our conclusion was that the mission of schools has really grown over the last 30 years. Whereas historically schools focused on the academic and athletic needs of students, now schools are seeking to address the needs of the Whole Child. What does this mean? To us it means schools are fostering the student’s social and emotional development – their sense of self and their connectedness to the bigger world. It means that in addition to sports, schools are promoting life-long healthy habits such as movement, yoga, nutrition and exercise – in short – wellness. It also means that schools are seeking to engage their students about the important issues facing their communities and the world at large. Why does this matter when discussing school design? Because the design of our schools can and should align with and promote the goals of the school both in the way spaces are designed and organized, and in the way the architecture expresses the ideals of the school community. So let’s get to it. How do we design schools for the whole child? To begin we have organized our thinking along three elements of the whole child: Wellness, Learning and Engagement, which somewhat loosely follow the common phrase “mind, body and spirit”. The difference in our view is that we reject the traditional mind/body division and instead focus on the concept of Wellness, which embodies both emotional and physical well-being. By creating healthy, safe child-centered environments, we establish an ideal setting for learning and personal development – for both students and teachers. Learning, as you can imagine, focuses on how school design can foster current pedagogy, namely 21st century learning concepts. We are all aware of the challenges of trying to implement these concepts in a traditional classroom. Engagement, speaks to the idea of connecting student learning and action to a larger context – to their school, local community, region and beyond. This is the outward looking element of the Whole Child Framework. The question in how can our schools be designed to facilitate artists-in- residence, learning in community, and gardening, for example. 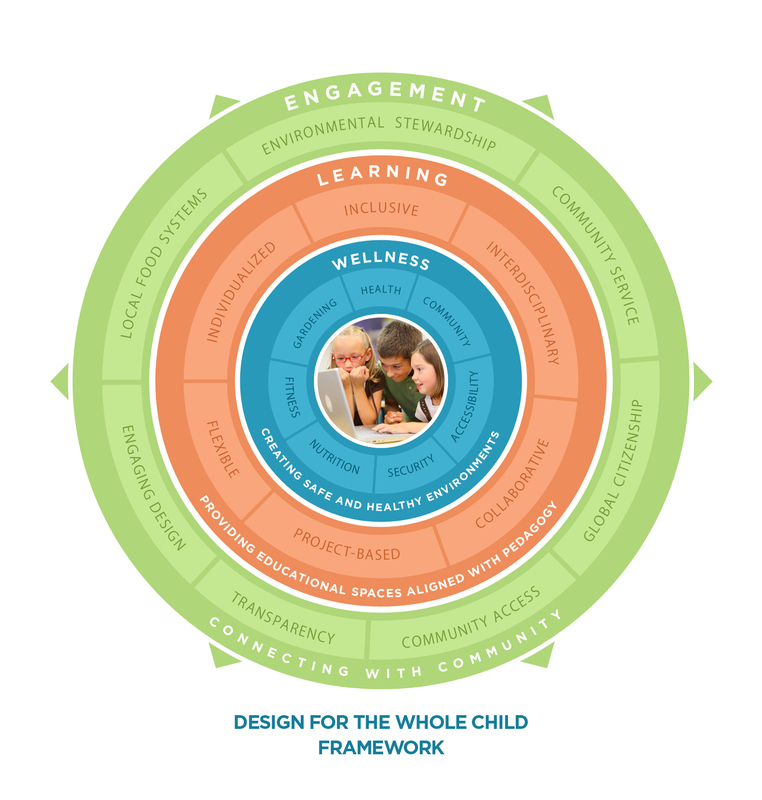 The relationship of these three elements can be seen clearly in the diagram with Wellness in the most innermost circle, representing the need to establish healthy, safe environments as a baseline for any growth and development in Learning, which is represented in the next larger ring. With this baseline established, students are in an ideal environment to develop the critical skills to be successful. Connecting their understanding beyond themselves to their school and larger community is part of the engagement process. Because this is an outward looking process, Engagement is located in the outermost ring. In the following articles, we will explore how schools can be designed to promote these ideas – how they can foster the development of the Whole Child. Intrigued? Stay tuned for the next article on how schools can be designed to promote Wellness.